Introduction: Musculoskeletal disorders can cause impact in quality of life. 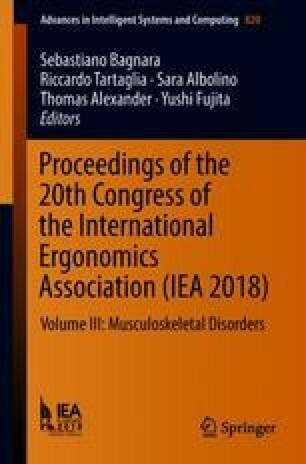 This exploratory preliminary study aimed to describe musculoskeletal complaints in a sample of employees in a tertiary hospital. Methods: A university public hospital has 6114 employees that work in an emergency and outpatient units. There are several occupations with predominance of nurses, computer users, cleaning and cooking staff. A sample of ten workers was assessed by, socio-demographic sheet, The Nordic body pain map, SF-36 questionnaire, and Work Ability Index Questionnaire. Data were described in terms of frequencies by SPSS™. Results: The sample had predominance of women (80%), mean age of 49.3 years old, all have children, working as nurses, administrative and general services. 50% has less than 5 years of experience, most have two work shifts, few are active in terms of exercise routine, 70% use medication for pain, do not have a sitting or standing working position preference. Nordic questionnaire showed predominance in pain complaints in back, neck, shoulder and knee. SF-36 questionnaire presented mean scores for subdomains: functional capacity 68.56, physical aspects 68.75, pain 42.72, general health status 67.37, vitality 66.72, social aspects 81.25, emotional aspects 70.83 and mental health 67.2. The work ability index questionnaire the majority of the scores was classified as moderate (28–36). Conclusions: This study showed that besides high scores for SF 36 for these sedentary women, most use pain medication for musculoskeletal complaints and was identified necessity improvement of the work ability. There is need for future study focused on ergonomics and exercises.